While exorcists admit that their ministry can sometimes be a heavy burden, it would be a mistake, they say to overstate the power of the Devil. As Father Amorth writes, "A priest who is afraid of the Devil is like a shepherd who is afraid of a wolf. It is a groundless fear." The Devil," says Amorth, is already "doing us as much harm as he possibly can." And so rather than fear him, exorcists say, it is better to emulate saints such as Teresa of Avila, who proclaimed, "If this Lord is powerful, as I see that He is and I know that He is, and if the devils are His slaves (and there is no doubt about this because it's a matter of faith), what evil can they do to me since I am a servant of this Lord and King? Why shouldn't I have the fortitude to engage in combat with all of hell?" It is a funny thing. A friend of mine is creeped out by any sort of horror story. I mention Stephen King or Dean Koontz and she shudders. However, she is the one who recommended heartily a book by Father Gabriele Amorth, an exorcist in Rome. Three pages into it, I had to put the book down because I was so freaked out. When we compared notes later we discovered that fictional evil scares her but real life examples of Satan don't bother her a bit. While, as we can tell, I am just the opposite. Not that a zombie movie (or dream) might not freak me out, but the real life evil is what truly bothers me. That might make you wonder just why I agreed to read this book. There's something fascinating about the idea of exorcism, don't you think? Also, I was intrigued by finding out just how objective this journalist was. 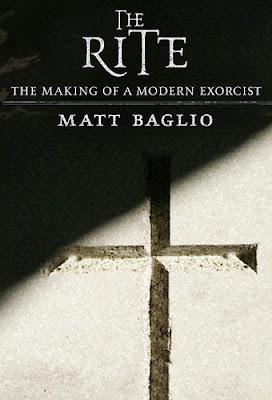 What I found was an objective journalist who did his homework, a sincere priest going through exorcism school in Rome, and that the real-life examples of evil given didn't bother me nearly as much as I thought they would. One can hardly read how matter of factly the priests in this book deal with extraordinary activity of the devil and not be impressed enough to do likewise. While it's technically true that any priest can perform an exorcism, not every priest should. Guideline thirteen of the Ritual states that the bishop can only nominate a priest who is "distinguished in piety, learning, prudence, and integrity of life." In addition, "The priest [...] should carry out this work of charity confidently and humbly under the guidance of the Ordinary. The importance of nomination by the bishop comes from the power of the prayer being tied to the Church as well as to the obedience of the exorcist. As the current president of the International Association of Exorcists, Father Giancarlo Gramolazzo, says, "I always use this phrase: The prince of disobedience is the Devil and you beat him by being obedient, not by your own personality, or charisms." According to Father Gramolazzo, if a priest were to perform an exorcism without the approval of his bishop, the prayers would still work to some extent because of the power of Jesus Christ's name, but they wouldn't have the same effect on the demon because essentially the exorcist would be praying the Ritual in a state of disobedience and the demon would know it. "Some priests have tried to perform an exorcism without the bishop's permission and the demon said to them, 'You cannot do it, you are outside your diocese and you don't have permission,'" says Father Gramolazzo. It is clear that Baglio is a serious journalist as he examines what popular culture takes as truth and corrects misconceptions. As well, he thoroughly examines many of the questions that occur to any logical person when faced with the idea of demons and possession in modern times. To this end he interviews psychologists, doctors, and other specialists for information. All this is told without ever inserting himself into the book which allows the focus to stay on the subject and on Father Gary, whose journey yielded spiritual growth in several ways.